The driver behind any collaboration must surely be to play to the strengths of those involved. In today's example this means a blend of Polyend's digital technology with the analogue skills of Dreadbox. I was already acquainted with the latter, having previously enthused over the Erebus synth, so I was keen to discover what Polyend brought to the table — literally in this case, since the Medusa is a tabletop synth, sequencer and controller rolled into one. The synth engine features six oscillators (three analogue, three digital), an analogue filter, five LFOs and five envelopes, while the sequencer boasts up to 64 steps of notes and synth parameters. There are three voice modes, one of which is a sort of 'paraphonic plus' where chords of up to six notes can be played and sequenced. And as a final bonus, the pads can be put to general controller duties with a DAW or other synths. 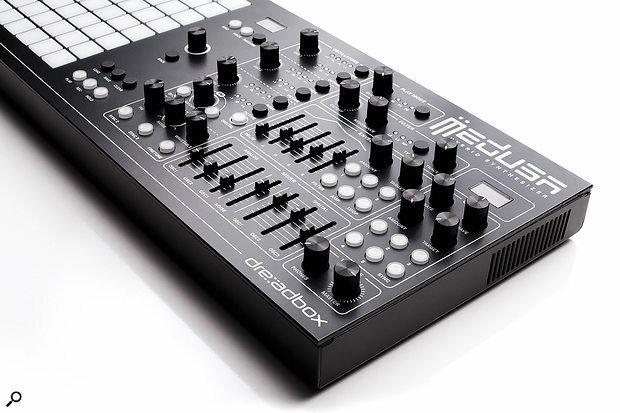 The Medusa is a thoroughly black and white experience, its low profile metal box sporting an 8x8 pad matrix, two neat and petite OLED displays and a number of buttons, knobs and sliders. Operationally, it's a game of two halves with a minimal transport and menu section sitting between the pads and synth controls. Generally the knobs and sliders feel OK, although the knobs wobble slightly. The audio connectors are more solidly held in place and consist of a single audio output, an input (for processing audio via the analogue filter) and a phones socket — all on quarter‑inch jacks. The round white buttons aren't the snappiest or most responsive though; occasionally I hit Play on the sequencer but the Medusa completely failed to notice. Having a layout with the pads on the left-hand side and the synth controls on the right felt slightly contrary to me as a right-hander. The small silicone pads have a pleasant squishiness and each one generates data in the X plane (pitch bend, side‑to‑side), Y plane (mod wheel, up and down) and Z (channel aftertouch, pad pressure). A recent firmware update also added velocity to the list of attributes transmitted from the pads in its controller guise. With a generous choice of scales and pad layouts, Medusa is therefore a performance surface that will take time to fully appreciate. MIDI is supplied via regular five-pin connections or USB, with the latter also used for firmware updates and patch dumps. Power is from an external 15V adaptor and the power-up sequence includes a calibration routine for the analogue oscillators, after which you're good to go. Polyend have crammed quite a lot of synthesizer into an area measuring just 227 x 170mm. Inevitably, this has been achieved by sharing controls and by tricks such as using single buttons to step through values. At any time, you can edit either trio of analogue or digital oscillators — a 'Digital' button lights to indicate when the latter are live on the controls. Regardless of type, every oscillator has four standard waveforms (sawtooth, square, triangle and sine) and three choices for octave shifting. You can squeeze a further octave up or down from the Tune knob, a control that switches from semitones to fine tune at the press of the appropriate button.